If I Tell You a Secret, Do You Promise Not To Tell Anyone? Can you sell the world? Back for 2019 – 20! Download your Passport Stamp Collector sheet here! READ about our 9 FAM Winners from last year! *Valid on land bookings deposited 1 April 2019 – 31 March 2020. Bookings must have land component with accommodation, and a minimum of 6 nights/7 days. There is no minimum dollar value. Air-only bookings do not qualify. 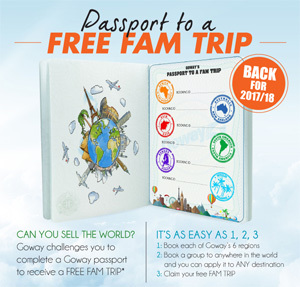 To claim the free fam trip, agents must make one booking to each of the following regions: Africa & the Middle East; Asia; Australia & New Zealand; Central & South America; Europe; Idyllic Islands Worldwide. A Group booking is a “wild card” and can be used for ANY of the 6 destinations. FAM trip needs to be claimed within 1 year of completing the Passport. Excludes taxes and fuel surcharges. No companions permitted on the prize trip. Prize trip is non-transferable. Still have questions? Visit our contest FAQS.